For small businesses that may not have the resources of other, larger businesses, marketing can be a challenge. Small business owners must think somewhat out-of-the-box. They have to rely primarily on word of mouth, social media, and a loyal customer base in order to be successful. The first thing small businesses can take advantage of is loyalty programs and offering rewards for shopping. Services like Foursquare, Yelp offer social media check-in specials, while Thanx offers rewards tracking that give customers a certain dollar amount off a purchase once they spend a certain amount. These services are inexpensive and easy ways to reward your current customers and entice new once to shop with you. Secondly, social media is a growing phenomenon. Customers expect businesses to be on social media these days, and furthermore, expect them to be interactive. In fact, over 40% of people expect brands to respond on social media within an hour. Maintaining a consistent, strong voice on Facebook, Twitter, Google+ and even Pinterest (the fastest growing social network) will help show potential customers that businesses have their finger on the pulse of your market. Perhaps most importantly is to monitor and maintain the business’ online reputation. 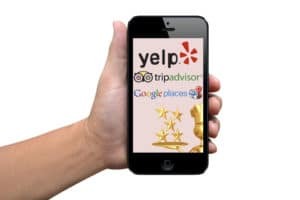 Small businesses MUST make sure they are checking out Yelp, Google+ Local, Trip Advisor and Open Table to see what customers are saying about them – and responding when necessary. We at Hospitality Defender firmly believe that when a business owner ignores online feedback, they are showing their current and potential customers that they just don’t care. This is especially bad for negative reviews. People are on Yelp so often these days, and so many people use it to choose where they are going to spend their money. In fact, a whopping 93% of consumers who use Yelp end up making a purchases at the business they looked up and researched. Businesses simply cannot afford to have their reputation un-monitored. Very often, a business can take a negative experience and win the customer back by making it up to them, and this can turn the customer into a raving fan, which translates into more word-of-mouth advertising. Utilizing simple tools such as these is the key to helping small businesses succeed. A commitment must be made to maintain and monitor the business’ online presence and stay on top of review sites in order to show customers that they are “in the know” and willing to do whatever it takes to win their business.